When it comes to prosthodontics, having an onsite laboratory is key to quality control and rapid turnaround time of implants, dentures, and other dental appliances. While many cosmetic dentists have to order custom appliances from technicians at offsite laboratories, our technical team is working on premises. They are available throughout your appointment to assess your dental appliances while they’re in your mouth and determine esthetic treatment accordingly. Their partnership and collaboration with Dr. Stone make our team adept at creating the results you deserve, quickly and accurately. By housing our laboratory in our Ft. Lauderdale office, Dr. Stone is able to maintain hands-on quality control of all the cases. When our team needs to make adjustments, they can do so much quicker than other practices that would generally have to return the case to a lab and wait for a week or two before re-trying. That means that you don’t have to suffer the embarrassment of leaving the office with missing teeth since the turnaround for many appliances is sometimes the same day. Dr. Stone and our team know that restoring your smile quickly will keep you looking and feeling best. But speed is only part of the benefit to the onsite lab. The level of quality control and craftsmanship our team employs results from our collective collaboration and unequalled standards of materials and skill. The Certified Dental Technicians in our laboratory have undergone specialized training in order to produce the level of high-quality work necessary to complement Dr. Stone’s expertise in cosmetic and implant dentistry. 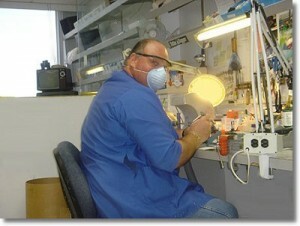 They use only the finest materials available for dental prosthesis construction. This eliminates worry over unreliable and unstable dental appliances. In cosmetic dentistry, implants, dentures, crowns, and the like all must perfectly match and emulate your natural teeth in order to truly reconstruct your smile. Dr. Stone and our team are committed to bringing you the best prosthodontic results with our onsite laboratory and expert technicians.